It is always challenging to drive in the winter or rainy season. Anytime, your vehicle can be damaged due to the bad weather or snow falls. To make it easier, you need to keep the extra tire snow chains all the times. 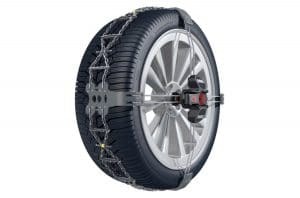 Now you will find different types of the snow chains for tires in the current market and some of them are very easy to put on and can increase your efficiency and safety. As the options will be many, you might find it difficult to choose the right one. If you want to make the choice easy and simple, then go through the following best tire chain review. 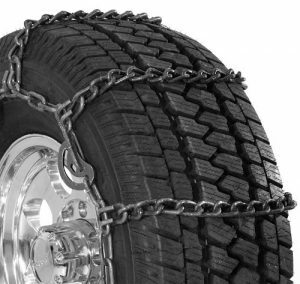 In this review, you will come to know about top five tire traction chains. Thule Super- premium tire chain comes with easy installation and removal system. It is made in Italy and comes with five years warranty. It is made of the super quality steel that makes the driving easy and comfortable. It has color coded assembly points that make it easy for the installation and removal. You can remove the chain in a couple of seconds without any difficulty. Some of the key features of this car snow chain are an easy installation, easy removal, ample traction, self-tensioning, and self-centering install. These chains can be safely used for the alloy wheels and ABS/ESP systems. It comes with the superior engineering and the latest designs.It has the most innovative way to install and remove in a couple of seconds. Once installed, it performs well for a long time. It offers a great grip. You might find it difficult to understand the instructions given in the manual. As some customers say, it is not durable. Thule Cross over Pro Deluxe Snow Chain comes with many developed and advanced features. It comes with five years warranty. It has an improved design with double traction plates to offer a proper grip and to increase the efficiency and performance. The chain comes with a micro-regulation system that provides great tensioning. Some of the key features of this chain are on-the-thread clearance, quick removal, easy to put on, self-centering removal, double traction plates, and self-tensioning. Besides, it comes with an innovative and unique color-coded touch design. It works beautifully for a long time. It is lightweight and offers excellent fit. It is worth for the extra money. It does not have a quick external release. Security Chain with Quick Grip Tire Traction Chain is one of the best selling products. It comes with some developed features that include quick grip, base link chain, durability, and off and on road use. It comes in a CAM style and it is specifically designed for every type of the use. You can use it for the passenger cars, airport transports, Garden tractor, forklift machines, snow blowers, and ATVs. This product has received appreciation for the proper grip, easy put on and removal system, and multi-uses. 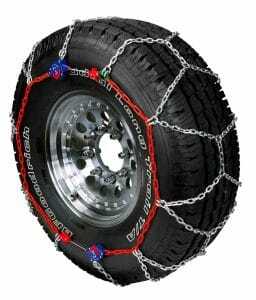 If you want to buy a chain for the multiple purposes, then this Light Truck Snow Chain will be an ideal option for you. It is a good heavy duty chain. It is easy to install and easy to tighten as well. It offers a great fit and a perfect grip. It will work great in winter. It offers a great traction. Some vibration might come while driving. These are too small and might not fit all tires. Hence, make sure that you are aware of the size before buying one. Thule Low-Profile Traction Car Snow Chain comes with five years warranty period. It is made of the superior high-quality steel that helps in comfortable riding and also improves the performance. It comes with the color coded assembly points that make it easy for the installation. Some of the key features of this product are an easy installation, easy removal, great traction, self-centering install, and self-tensioning. It is specifically designed to ride on the external surfaces of your tire. You just need to simply lay the chain on the tire and attach the chain to a bolt and then activate the ratchet. It comes with a superior design and latest engineering. It can go well in all the weather conditions that you cannot expect from others. It offers great ice and snow traction. It actually self-adjusts with your tires after the proper fitting. The ratchet mechanism is not that good and it can easily break if you do not handle it carefully. It is easier to put on but difficult to keep on. SUV and Light Truck Tire Chain is received much appreciation from the users for some of its developed features. Some of the key features of this chain are automatic tightening, centering, easy put on and easy removal within a couple of minutes, superior traction, cross chain for a smooth ride, and meets the S clearance requirements as well. As it comes with the self-tightening system, you will not have to do any effort for the proper fitting, adjustment, and the tightening. It comes with an easy to use and convenient nylon carrying case. It is worth buying as it meets all your requirements. It offers a perfect grip on the ice and snows. It comes with the self-tightening system. It comes with a nice design. It does not come with a great mechanism as the ratchet stops working for no reason. The size might not be proper for all the tires. Hence, make sure that you have a proper idea about the size of your vehicle’s tire and the traction chain. Otherwise, it will not fit well. A lot of snow gets accumulated on several roads and freeways in winter, which soon turns into hardened ice over the days. This brings several problems for drivers as their vehicles either get stuck in snow or skid on icy, slippery surfaces. 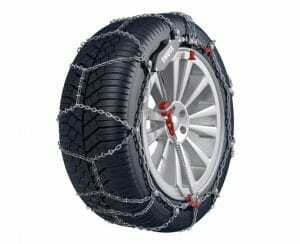 Tire chains are used to cover tires of vehicles while driving on ice laden roads. Use of tire chains assists in traction of wheels and stops vehicles from skidding. Installing tire chains doesn’t have to be a complicated process. Almost all sets of tire chains come with installation instructions, and often manuals for a four-wheel drive, and similar features will specify which tires should be tired chain clad for maximum efficiency when operating in a given mode. Additionally, online tutorials offer brief videos and step-by-step advice which can be useful for first-time tire chain users. Before installation, it’s essential to verify that the chains are indeed the right size for the tire. The sidewall of the tires must be marked to indicate size with a combination of numbers and letters. One or two letters may come first and refer to the kind of vehicle-P for passenger, LT for light tuck and the other three numbers that follow can refer to the tire’s width in millimeters. The numbers which follow tire width refer to the tire’s width to height ratio. Then, the letter R will seem, to indicate radial ply tires. Lastly, two numbers will refer to the rim diameter. Based on the plethora of information imprinted on the tire, selecting the correct size chain should be much easier. Whether you are driving in mud, snow, ice, or rain, tire chains are an excellent way to give your extra vehicle traction, providing additional safety for the most valuable cargo you have – yourself, other passengers, and your kids. Before purchasing tire chains, ensure it is legal to apply them in your state. Once you have gotten which chains will get you to safety and the ones that will get you a ticket, drivers must then consult their owner’s manual to discover which kinds of chains can be utilized on their vehicle. The purchaser should also have in mind how he plans to use the chains (in mud or snow, etc…). Drivers have several options to original. Some of the primary designs include diamond tire chains, cable tire chains, ladder tire chains, and V-Bar tire chains. Cable tire chains are economical, lightweight and ideal for carriers with low fender clearance. Tire chains are something that every car owner should have. You may not need to use them often, but when there is considerable snow on the ground they can make it much safer to drive. Even if you have winter tires, it’s not a bad idea to keep a set in your trunk for heavy snow storms. If you are to buy a new set, it’s a good idea to familiarize yourself with the different types available. Cable chains are the most common types of chains sold for personal vehicles. They are light weight and easy to put on. These are constructed of metal strips that are placed horizontally on the tire. These are secured using rubber tighteners, making them very simple to use on most types of tires. These may bring a little more, but they also typically last longer than other types of chains. Ladder chains are an old design, but they are very effective. Until recently, these were the most popular type of chain on the market. While they have fallen from the number 1 spot, they are still popular. These are designed in a ladder design that will go directly over the tires tread. There is a disadvantage with these over other types that small spaces between the cross bars allow parts of the tire to contact the icy road without the advantage of the chain. These are best for individuals who only require driving short distances. Diamond chains are popular for those who need to travel longer distances. These use metal strands that interlock in a diamond pattern. The chains cross the tread at intersecting angles and allow for coverage over a larger surface. Another nice feature of the diamond patterned chains is there is less vibration from them while driving. Zig-zag patterned chains are used commonly on vehicles that have some form of traction control, such as anti-lock brakes. The cables are created with a zig-zag pattern that crosses over the tire tread. This creates maximum contact with the road and offers better traction than other types of chains. Having the chains in your trunk is only the first part. You have to know how to put them on before they can be used. Don’t wait to learn to do this until you need them. The first time you put on the chains, it can take some time, and you don’t want to stand around outside in freezing conditions trying to contend with these. Start by making sure your car is parked away from traffic. If you can do this in a garage or a parking lot, it will be safer. Check to make sure the chains haven’t tangled or otherwise twisted. The cleated side of the chain should face up when installed. Drape the tire chains over the top of the tire. Straighten the chain out to evenly distribute them over both sides of the tire. Fit the chain, so it is secured around the tire. Use the hooks or latches that were provided with the chains to secure them as tightly as you can to the sidewall. Drive a moderate distance, and get out and check to ensure the chains are secured. 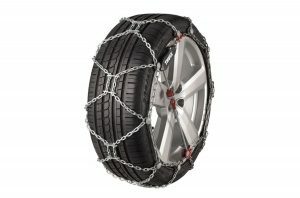 The wide array of tire chains enables drivers of all varieties of vehicles to guard themselves against dangerous driving conditions. While tire chains are meant to give more protection by providing better traction, drivers must make sure to follow all directions precisely to limit the chains from becoming a risk instead of aid.